A Plea to Science Writers: Scientists Don't Believe in Their Research..
Kim at All My Faults are Stress Related thinks we need some new geologic metaphors. Her blog post resulted in a real melange of great suggestions. I like the idea, but I would add that I believe we also have a need for new words for describing to the general public the findings of science. What's my problem? The fact that many a story about a scientific discovery begins with the statement "scientists believe...."
How should we describe theories and well-grounded scientific principles? What words should we be using? Or leave "scientists" out of it. What's wrong with a straightforward declarative statement of fact? Like it or not, the word believe has many meanings, but in today's society (American, anyway), it has religious connotations, and is opinion-based in usage. We like our facts boiled down into polls that we can pick and choose from, like food from a buffet line. If a scientific finding is uncomfortable to us, or challenges our assumptions, we can choose not to believe it. Science writing should not feed into that. Time Beyond Imagining - Where did the Ancient Enemy Go? Bandelier National Monument on the flanks of the Jemez (Valles) Caldera is a fascinating place to observe Pleistocene geology, being the site of a massive rhyolite eruption only 1.15 million years ago (back to geologic time instead of human time; so much for yesterday's post on deep time...). Subsequent erosion carved canyons into the slopes of the volcanic edifice that later provided arable environments when humans arrived in the region within the last 10,000 years. 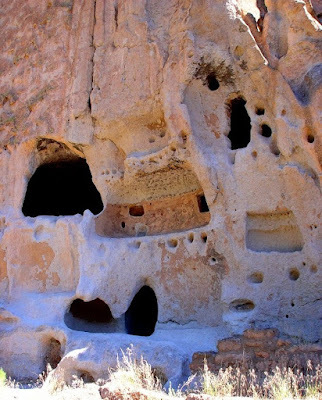 Their construction of these dwellings in Frijoles Canyon provides a piece to an interesting puzzle. Part of the mystique of the Colorado Plateau has to do with the disappearance of the Anasazi People ("Ancient Enemy" in the Navajo language. I know that name is out of vogue, but bear with me on this). A number of reasons have been advanced to explain why essentially the entire region was depopulated about the end of the 1200's. They point to a disastrous 25-year drought, soil and resource depletion, religious influences, invasions and warfare. For years it was standard procedure to promote this deep mystery of "where did all the people go, and why?" I haven't read the book in years, but even Louis L'Amour got in on it with Haunted Mesa, where I guess they disappeared into some different dimension or something (I didn't think it was one of his better efforts...). Not being an anthropologist, I am perfectly satisfied with the idea of the stress of a drought as the root cause of the migrations out of the region. Making a living on the plateau has always been a dicey proposition, and it still is today. Big cities like Phoenix, Salt Lake City, Albuquerque and Las Vegas flank the plateau country, but few towns thrive in the midst: Flagstaff, Moab, Farmington, Cortez, and a few others, totaling a few hundred thousand people at most. Water is a limiting factor, and even today with all the technology we have for pulling water up and out of rivers and from underground, most towns on the plateau barely have enough. Water for use by the 4 million yearly tourists at Grand Canyon is captured at a spring on Bright Angel Creek deep in the canyon, and pumped up 5,000 feet to both rims. There is, in fact, a tremendous amount of water available on the Colorado Plateau. The Colorado River offers something like 10-15 million acre-feet each year, even in the dry ones. But where is the river? Across most of the plateau, the Colorado flows through deep canyons, far from any kind of arable lands. Today, to make use of the water, we've had to construct giant monstrosities of dams and reservoirs to capture the water, and a huge network of canals and pipelines to distribute the water to where we have chosen for it to go. That technology wasn't available 700 years ago. If you were a community of people living on the edge, depending on the yearly rains that simply weren't coming, the choice boils down to migrating elsewhere or starving. A prolonged drought would have serious consequences: crops would fail, hunger would be widespread, soil erosion would commence, and in an such an environment, one could understand that a fight for survival might mean a fight with others for limited resources. Religious beliefs would certainly play a part, since the gods would be presumed to be angry, and they would need to be placated to bring back the rain. As to the "where" part of the question, that is somewhat less of a mystery. They moved to where dependable water supplies could be found. For some communities, these were the mesas that nowadays form the Hopi Reservation. Some of the towns there have been occupied continuously since the 1100's. Others headed south and east into the Rio Grande River country where two dozen different puebloan groups continue to live today. The Acoma and Taos pueblos have been continuously occupied for around 1,000 years, and the village at Bandelier was constructed about 1150 AD. The term "Anasazi", mentioned before as meaning "ancient enemies" by the Navajo, has no precise meaning. The haunts of the people now called "Ancestral Puebloans" on the Colorado Plateau had been abandoned by the time the Navajo people arrived in the region. Does the story of the Ancestral Pueblo people on the Colorado Plateau have any relevance to our society today? Ya think? The southwestern part of the United States is in the midst of a historically unprecedented drought that is probably influenced in large part by global warming. There are serious concerns that Lake Powell and Lake Mead could conceivably go dry in a decade. The effects are being felt at Bandelier as well, although ecologists don't see the effects as all bad. Just the same, millions of people depend on the Colorado River. If the modeling is correct, we have some serious choices to make concerning water use in this arid region. The first picture of the day shows Frijoles Canyon in Bandelier with the rim of the Valles Caldera on the horizon. The ruins in the main canyon include the unique cliff houses (second picture) carved directly out of the softer parts of the rhyolite (the linear pattern of holes is where timbers were inserted to hold up floors and roofs). Harder chunks of rhyolite were used to make the bricks that form the buildings in the village called Tyuonyi on the main nature trail at the monument (third picture). 1.15 million years ago, a massive explosion shook the New Mexico landscape, and some sixty cubic miles of ash shot into the atmosphere in a catastrophic rhyolite caldera eruption. The collapse of the magma chamber produced the Valles (Jemez) Caldera. Some of the ash traveled as far east as Iowa, but most of it was dumped on the flanks of the volcano in layers hundreds of feet thick. It was so hot upon landing that the material fused back together into a solid light-colored rock called welded tuff. Smaller eruptions followed, the most recent around 50,000 years ago. Erosion has been eating away at the margins of the caldera, forming a number of deep canyons (see this map of the caldera). One of these canyons is called Frijoles, the "Canyon of the Beans". Tucked away in Frijoles Canyon one of the more interesting national monuments in the park system: Bandelier. It preserves the remains of an Ancestral Pueblo village that was built nearby and sometimes right into the welded tuff generated by the Jemez Caldera eruption. It is a fascinating place to explore. Although humans had passed through the region for portions of the previous 10,000 years, the village was built around 1150 AD and abandoned about 1600 AD. A couple of divergent thoughts crossed my mind when I was considering a post on Bandelier National Monument. They had to do with deep time, and the wanderings of people. Wanderings takes up the next post. Here, I wanted to provide a bit of perspective about geologic time. A thousand years seems a long time to the casual tourist wandering through these very ancient dwellings. We can feel a connection to these people sometimes as we look at the drawings they made on the rock, or the personal improvements in the living spaces in the rock rooms of the village built into the cliff. And yet they seem far removed by time. The year 1600 seems impossibly distant to our daily lives. Still, there were (and actually still are) people in my life who were personally acquainted with Civil War veterans. And those veterans would have known people whose lives reached into the 1700's. Two or three degrees of separation...it isn't that far back is it? We can perhaps visualize that kind of time if we work at it. But 1.15 million years? Even though we have actually covered 2 billion years in this series on the Colorado Plateau, I sometimes find even a million years difficult to comprehend. One million. One thousand thousand. 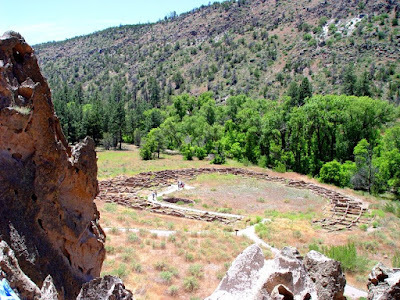 The entire history of Bandelier's village, from construction to abandonment to tourist destination could be repeated 1,000 times to reach the time when the volcano exploded. And beyond that: the history would have to be repeated 65,000 times to reach the time when the dinosaurs disappeared, and more than 200,000 to reach the time when dinosaurs first appeared. And they appeared relatively late in Earth's history. Deep time is one of the four great discoveries that mark the biggest advances of my science, that of geology: the others were the principles of uniformitarianism, evolution, and plate tectonics. The first two are largely credited to one man, James Hutton, and evolution is credited to Alfred Wallace and Charles Darwin, although others were involved. Plate tectonics was the discovery of dozens, even hundreds of researchers, although Alfred Wegener is given credit for kick-starting the idea though sheer stubbornness (I guess this should give the Alfreds of the world some hope!). 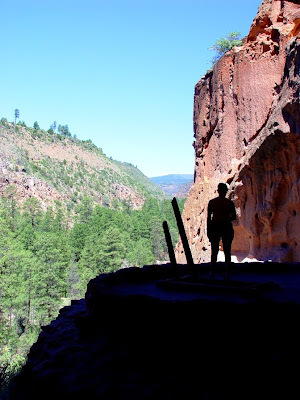 Bandelier National Monument is a fascinating and scenic place to wander. The top photo is of a kiva set in a high alcove in the upper canyon. Getting to it requires an acrophobic climb up some high ladders and narrow trails. The rocks of the canyon walls are full of holes caused by cavernous weathering of the relatively soft rock. Along the canyon floor, the Puebloans scraped and scooped out the rock to make their living spaces larger and more comfortable. I will have some more photos of the ruins in my next post. Camping and other facilities (mostly built by the CCC in the 1930's) are available. Ok, this really is a coincidence. I posted a couple of pictures recalling the Happy Isles rockfall of 1996, and this happens today in Yosemite Valley. A rock fall from the Royal Arches slightly damaged some parked cars, and forced the closure of the Ahwahnee Hotel until Friday so the chances of more activity can be evaluated. Boulders were the size of "microwave ovens". Thanks to Loyd Schutte and the Yosemite Blog and the Yosemiter for up-to-date info. Thanks to Loyd for the morning photo link! I've enjoyed Miller's stories (this is the fourth in a series) for a number of reasons. For one, it's nice to have an author that gets the setting right. I loved Tony Hillerman's mysteries, and his understanding of Native American culture was extensive, but I would get tripped up when all of a sudden his detective was stumbling around in limestone caverns at Lake Powell, which is not likely. I spend a fair amount of time in some of the places Miller writes about: Riverside, the Mojave Desert, eastern Nevada, and others. She captures the sense of these places well. And, much of the plotting is plausible. I love reading Thomas Perry novels but no real human being could survive the assaults his protagonists suffer without going absolutely nuts from PTSD. Or being dead about 30 pages into the story. Miller's mysteries are more character-driven, and less action-driven. Finally, being not a literary reviewer, I will simply say I enjoyed having enough clues to be able to have an inkling, if nothing more, of who the murderer or murderers were. It's nice that we geologists get to have a few literary heroes (check out the Sarah Andrews series of mysteries with the Em Hansen character for another example). 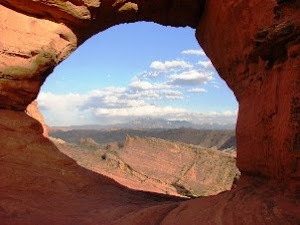 For some other mysteries with a great sense of place, be sure to check out the Nevada Barr and Tony Hillerman novels (my criticisms above are trivial, really). One more series you may have missed are the Jessica Speart novels with a Fish and Wildlife Service agent as the protagonist. Today's photo is some of the most famous hoodoos of all, those at Bryce Canyon National Park in Utah. I was looking for something else in the massive pile of old slides and photographs at the department today, and ran across a pair of photographs of taken a few weeks after the Happy Isles Rockfall of 1996, one of the more damaging historical mass wasting events in Yosemite Valley. 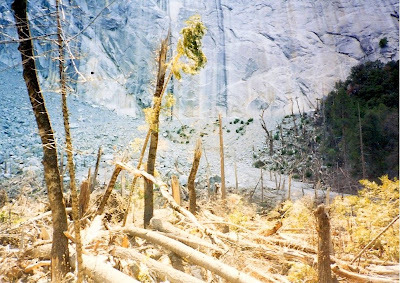 The pictures recall a flurry of posts last spring about the Ahwiyah Rock slide near Half Dome. The 1996 event killed one person and severely injured another, destroyed a food stand, and damaged the Happy Isles Nature Center. The rock involved in the event was a slab of exfoliated granitic rock roughly the size of a football field that broke off from the top of the cliff near Glacier Point, slid for several hundred feet and then fell 1,800 feet, hitting the floor of the valley at a speed of something over 200 mph. 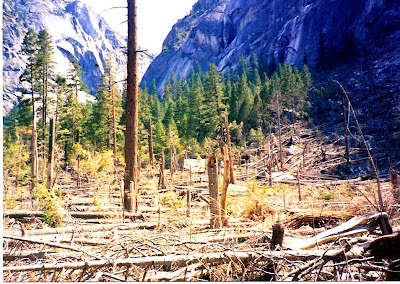 The rocks exploded on impact generating an airblast that toppled 1000+ trees. U.C. Berkeley has an excellent analysis of the slide here, and formal article from the GSA Bulletin can be found here. Regrowth of trees and shrubs has obscured much of the damage, but the Happy Isles Nature Center has a nice exhibit and viewpoint; walk out the back door of the museum to find it. The slide was not the first in the area. Huge talus piles cling to slopes below the breakaway point, and a much larger prehistoric slide has been mapped beneath the thick forest. It forced the Merced River into a new channel, and contributed to the formation of the marshy area west of the campground. Time Almost Beyond Imagining: Who Do the Magic that Hoodoo? Sorry for the title. Sometimes such things are irresistable, and geology terms sometimes seem to lend themselves to parody: subduction, orogeny, bedrock, schist and gneiss. 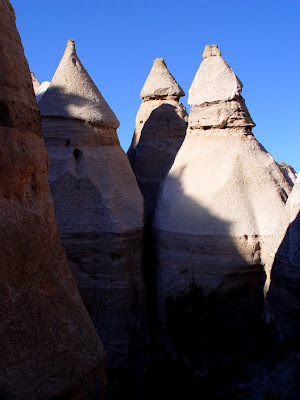 Just the same, today's post is about one of the stranger places in the Colorado Plateau country: Kasha-Katuwe Tent Rocks National Monument on the flanks of the Valles Caldera, site of the previous post on the latest part of the geological story of the Colorado Plateau. It's got a lot of unique scenery packed in a small area. The Valles Caldera is one of the nation's active supervolcanoes, and over a period of more than six million years, the eruptions of the center have blanketed the region with rhyolite tuff and ash. If you look at a physiographic map of the caldera you can see that erosion has sliced into the flanks of the volcanic complex, exposing evidence of older eruptions. The scenery at Kasha-Katuwe is the result of this geologically recent erosion of the soft volcanic rocks. Some of the layers on the flanks of the caldera contain river and mudflow deposits with boulders and cobbles of all sizes. The larger boulders protect the softer underlying rocks from erosion until the boulders stand at the top of tall pillars (see the third picture). 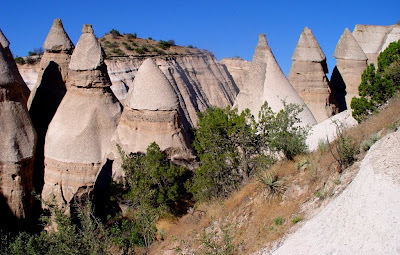 These are hoodoos. Eventually the boulders topple, and erosion attacks the underlying rock, producing the strange conical spires that give the monument it's name (the English part anyway; Kasha-Katuwe refers to "white cliffs" in the Keresan tongue). 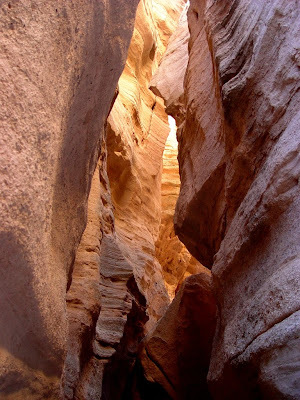 The erosion of the soft rock by flash floods in this arid environment have also led to the formation narrow steep-walled slot canyons (the fourth photo). The monument is a bit tricky to find; the park brochure and location map can be found here. 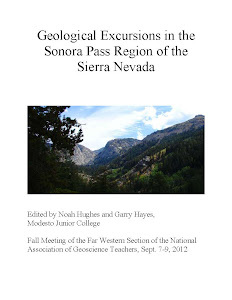 The New Mexico Bureau of Geology and Mineral Resources has a nice review of the geology of the region. If you ever pass through the Sante Fe-Albuquerque region on a field trip, check it out! Top picture of the Valle Grande by Garry Hayes. 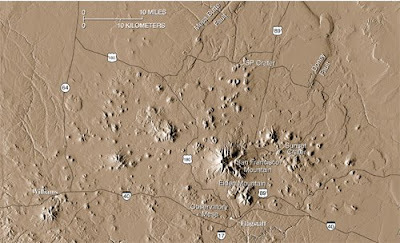 Bottom image of the Valles Caldera courtesy of the New Mexico Bureau of Geology and Mineral Resources. I will probably get a bit of geographical argument about today's geological feature, as it might not really be considered part of the Colorado Plateau, and more a part of the Rio Grande Rift, but it is on the plateau side of the rift, and on my field trips to the plateau, it is an important stop. So there you go. I've been moving towards wrapping up my long running series of posts on geological history of the Colorado Plateau, and we are into the last few million years of plateau history. At 6 million years, the final parts of the Colorado River system were established and the main carving of the Grand Canyon had begun. Volcanism began in the Flagstaff region, with numerous cinder cones, lava domes, and a stratovolcano forming the San Francisco Peaks Volcanic Field. Further to the east, the crust was stretching and breaking the crust to form the deep trough of the Rio Grande Rift. Like the peaks near Flagstaff, the faulting of the rift provided an avenue for magma to reach the surface. Unlike the Flagstaff area, the volcanism manifested itself in a totally different and violent way. This is the Valles (or Jemez) Caldera of New Mexico. Valle Grande in the midst of the caldera is a beautiful serene high altitude prairie surrounded by and containing numerous forested lava domes reaching elevations as high as 11,000 feet. The grasslands fill a crater-like depression 12 miles in diameter. The peaceful scene belies a catastrophic origin. As America's first national park, Yellowstone gets a lot of press, historically for all the geysers and bison and stuff, but more recently because of documentaries about "supervolcanoes" on various science-related cable channels. I'm sure the film-makers would never stoop to broadcasting sensational stories about impending eruptions that would destroy life across a broad swath of the continent, but somehow people have gotten that impression. Just the same, Yellowstone in modern times has developed a reputation as a spectacular example of an active rhyolite caldera. What is not so widely recognized is that the continental United States has at least three active caldera systems: Yellowstone, Long Valley in California (Mammoth Lakes), and the Valles Caldera in New Mexico. And a major eruption from any one of them would be a true catastrophe on par with a asteroid impact. The good news is that such eruptions are rare, with hundreds of thousands of years of volcanic quiescence between major events. Eruptions have been taking place in the vicinity of Valles Caldera for six million years. 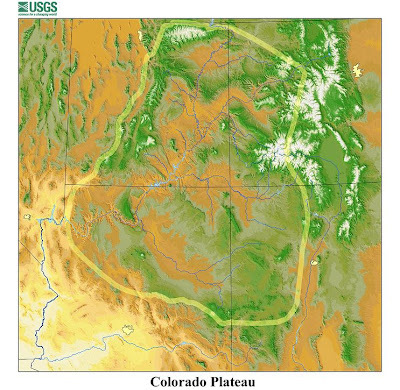 A major caldera formed in an eruption about 1.5 million years ago (the Toledo caldera), and then the eruption of the Valles Caldera destroyed the older caldera and formed the present depression about 1.15 million years ago. It is hard to imagine the scale of such events. The last eruption in the lower 48 states, that of Mt. 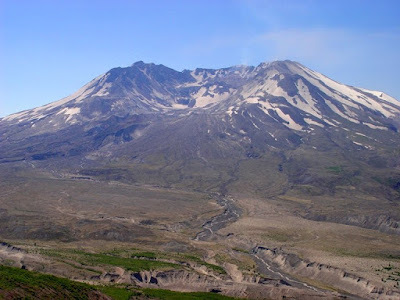 St. Helens in 1980, produced about a quarter of a cubic mile of ash and lava. It killed four dozen people and devastated 150 square miles. One of the most famous eruptions in modern history, at Krakatoa in 1883, was the equivalent of 20 St. Helens eruptions, producing 5 cubic miles of ash. The eruption of the Valles Caldera produced just more than 60 cubic miles: the equivalent of 250 St. Helens. With so much material blown out from the magma chamber, the ground above could not remain stable, and it collapsed into the void. Ash from the eruption covered a multi state region; near the volcano it was so hot that as it landed it hardened into a solid rock, welded tuff. In the millennia that followed, magma refilled the chamber and the center of the caldera rose several thousand feet. Smaller eruptions produced a number of lava domes, the most recent around 50-60,000 years ago, but the volcano is not dead. Magma still simmers deep in the crust under the caldera. 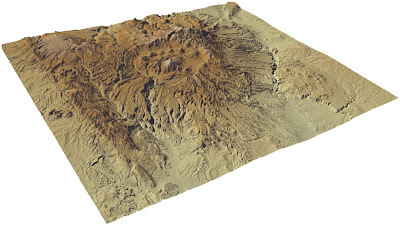 Valles is now considered an ideal of example of a resurgent caldera. During World War II, physicists first caused a nuclear chain reaction in Chicago but prudence dictated designing the atomic bomb in an isolated location. They chose the flank of Valles Caldera, and the Los Alamos National Laboratory was built on a potentially active volcano. Research continues there today, although the level of secrecy is somewhat less than it was; you can drive through town without being challenged by armed guards, although you may get irretrievably lost if you make a wrong turn on the confusing streets. The caldera was a private ranch, but in recent years was given to the federal government and is now managed as a national preserve, which is kind of like a national park, but is supposed to be economically self-sustaining. Two other geologically significant parks are found on the flanks of the caldera: Bandelier National Monument, and Kasha-Katuwe Tent Rocks National Monument. They will be covered in subsequent posts. Andrew Alden, as he often is, is right on top of a great idea, a proposal for a Geological Conservancy, modeled along the lines of the well-known Nature Conservancy, and less well-known groups like the Archaeology Conservancy. The proposal is outlined in some detail here, in the SIPES Quarterly. I think the idea is well worth exploring. So many geologically significant outcrops and roadcuts lie outside of national parks or monuments and are constantly threatened with destruction. Roadcuts are especially vulnerable, as road maintenance crews are often ignorant of the importance of the rock faces under their care. I've illustrated three famous sites in California that fall into this category. The first is the Shoshone Roadcut, often referred to as the Charlie Brown Outcrop (the Charles E. Brown Highway). It illustrates in a wonderful manner the relationships of extensional faults and ash flow tuffs/air fall tuffs in the Basin and Range Province. The surrounding lands are administered by the Bureau of Land Management. The second picture is the Sherwin Summit roadcut (the "Big Pumice Cut") that settled the question of the age of the Sherwin Glaciation of the Sierra Nevada in relation to the well-dated eruption of the Bishop Tuff. 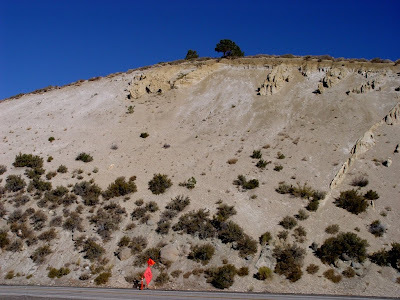 It is a cherished outcrop to legions of California geology students, but at various times road groomers have threatened to cover the outcrop with vegetation, or alter itto a great degree. I believe the land behind the outcrop is managed by the U.S. Forest Service. 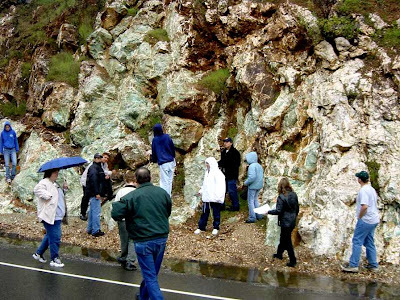 The third photo is one of our local special outcrops, where quartz and mariposite veins of California's Mother Lode cross a major highway near Coulterville. The site illustrates the relationships of the ores with the surrounding metamorphic rocks which formed within a subduction zone complex in Mesozoic time. One would need access to an underground mine to have an equivalent view of these complex relationships. The land back of the highway is privately owned. These kinds of outcrops don't have the natural constituency that places under the protection of the Nature Conservancy often have. They are not always scenic, and they generally don't form a critical habitat for rare plants or animals. 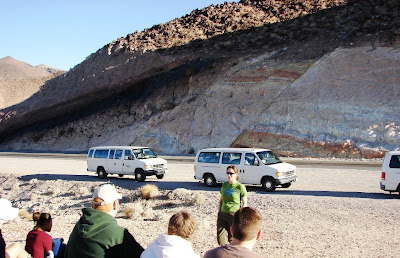 But they do offer an invaluable educational experience for learning the basic principles of geology. They should have some form of protection, and a conservancy might be a good approach. I worry a little about publicizing some of these places, though. Outside Las Vegas, at Frenchman Mountain, the UNLV geology department spent years and lots of money on building some wonderful monuments describing the Great Unconformity between Proterozoic gneisses and Cambrian sandstones. They were vandalized almost right away, and people continue to dump rubbish in the canyon (the site is periously close to a tsunami of housing developments on the northeast side of the city). What do you think? Is this worth pursuing? How has the ability and resources to administer such a program? What kinds of places exist in your area that deserve some kind of recognition and protection that they are not receiving now? Did you ever go to one of those summer camps where they gave you a piece of string, a straw, a stick, a rubber band, and then told you to make a can opener out of it? Or have you ever been an astronaut stranded in space who had to make a carbon dioxide scrubber out of duct tape and technical manuals? If so, I have a question for you at the end of the post. What happens to community science knowledge in times like this where there is no money for science teaching, none for field trips, no resources? Well, in our case we (my community college science division professors) are putting together a program for local fifth graders in which they will come onto our campus for their "field trip" to see real live scientists who will be giving them demonstrations and hands-on lab experiences. We don't have grants or really any other resources, and the presenters are all volunteers. We are calling the program SEEK, for Science Encounters for Elementary Kids, and I could use some ideas. Here's the question: you are given one standard geology lab, with the usual maps, fossils, rocks and minerals (oh, and a working seismometer), and you have 35 fifth-graders for 45 minutes. What would YOU do to open up the world of the earth sciences to these kids? I have some ideas, but I would sure like to hear from folks out in the geoblogosphere and elsewhere. Once a region has risen high above sea level, and rivers are established to convey sediment, one might assume that the eventual result will be the complete removal of the rocks and the erosion of the region to a near sea level peneplain, at least until another cycle of uplift begins. Certainly that was the attitude of geomorphologists at the end of nineteenth century and the beginning of the twentieth century. Relationships exposed in the Grand Canyon seemed to bear this out to an extent, with the exposure of two major unconformities that suggested just such erosional smoothing of the landscape. It was all so cyclical, and so uniformitarian. As the decades passed, it became clear that crustal evolution was not nearly so neat and tidy, and that the geological history of any region was cluttered with all manner of untidy complications. In the far west section of the Grand Canyon, faults related to the Basin and Range extension slice through the plateau with vertical offsets of hundreds, even thousands of feet. In addition to scrambling the landscape, they also provided a convenient pathway to the surface for magmas generated deep below in the upper mantle. Some of the resulting lava flows are easily seen near St. George and Zion National Park where they are a spectacular addition to the scenery. But, one of the most profound places I have never seen (I had to borrow the photos) contains one of the most bizarre parts of the Grand Canyon story. It's where lava flows invaded the realm of the Colorado River: the Uinkaret Volcanic Field. "August 25, 1869 Great quantities of lava are seen on either side; and then we come to an abrupt cataract. Just over the fall a cinder cone, or extinct volcano, stands on the very brink of the canyon. What a conflict of water and fire there must have been here! Just imagine a river of molten rock running down into a river of melted snow. What a seething and boiling of the waters; what clouds of steam rolled into the heavens. " Geologists who have been able to make more comprehensive studies of the region have come to a more startling conclusion. Lava flows didn't just reach the river. They dammed the river. Among the 150 individual lava flows in the Uinkaret from 1.8 million to just 1,300 years ago, at least 13 spilled over the cliffs into the river gorge, accumulating enough bulk to dam the stream. These were not modest dams: one of them was more than 1,500 feet high, enough to form a lake reaching hundreds of miles upstream into Utah. Such lakes would have been easily visible from the rim of Grand Canyon National Park. The past existence of the dams was recognized early, in the late 1800's. What was not so well understood is what happened to them. It was assumed that the dams were simply eroded away over several thousands of years. Anyone who has looked closely at a lava flow will realize that they are not as solid and monolithic as one might think. The cooling lava fractures and splinters, and in water will form loose globular masses called 'pillows', or simply explode into sand-sized particles. In other words, not the first choice of dam-building material that a dam engineer might choose. Deposits exist high on the walls of the western Grand Canyon which contain large boulders of basalt derived from the lava flows. One of them is 115 feet across. How do you move boulders of this size? The most current research is suggesting that at least five of the dams failed catastrophically; once they were breached by the river, they fell apart in a matter of days or weeks. The amount of water unleashed on the lower canyon is almost unimaginable. A modest 'fake' flood produced by releasing water from Glen Canyon Dam up the river might involve 40-45,000 cubic feet per second flows. The largest historically recorded flood (in 1884) produced flows of about 300,000 cfs. A researcher has found evidence of a flood of 400,000 cfs around 4,000 years ago (my memory may be failing me, but I think it involved flood debris in a cave high above the river which also contained human artifacts). Estimates of major floods during the Pleistocene ice ages range in the vicinity of a million cubic feet per second. The collapse of a 1,500 foot tall lava dam may have produced a flood of 15 million cubic feet per second. That's more than 30 times larger than the biggest flood ever recorded on the Mississippi River. That's how you move 115 foot boulders...and carve a 2,000 foot deep gorge in the last 700,000 years or so. Fenton, C.R., Webb, R.H., Cerling, T.E., Poreda, R.J., and Nash, B.P., 2002, Cosmogenic 3He Ages and Geochemical Discrimination of Lava-Dam Out-burst-Flood Deposits in Western Grand Canyon, Arizona, in House, K. et al., eds., Paleoflood Hydrology, American Geophysical Union, p. 191–215. Hamblin, W.K., Late Cenozoic lava dams in the western Grand Canyon, 135 pp., Geol. Soc. Amer. Memoir 183, 139 pp., 1994. 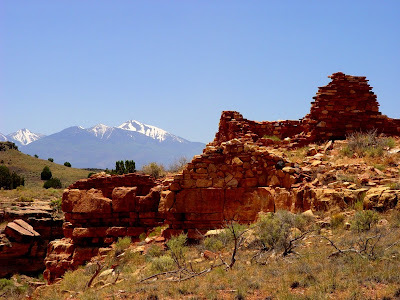 Top photo shows the San Francisco Peaks looming over the ancestral Sinagua ruins at Wupatki National Monument near Sunset Peak. Bottom diagram is a digital topographic map of the San Francisco Peaks Volcanic Field from the USGS Fact Sheet 017-01. Six million years ago, the Colorado River was just beginning to carve the Grand Canyon. The rest of the Colorado Plateau had risen to thousands of feet above sea level, and was being vigorously eroded, but around the edges, other things were happening: the land was falling away, so to speak. The Basin and Range (and the related Rio Grande Rift) were being stretched, and in response the crust split into numerous fault blocks, some bobbing upwards into mountain ranges, and some blocks sinking to form deep basins (the deepest, such as Death Valley, eventually sank below sea level). Such stretching of the crust is a prelude to the breakup of the North American continent. The splitting of the continent is not an instantaneous process; it has been evolving over the last 20-25 million years as convergence was ending on the west coast of the continent, and the San Andreas fault system was slowly expanding. The stretching and thinning of the crust released the pressure on the underlying mantle rocks, allowing them to partially melt and start rising through the overlying crust. 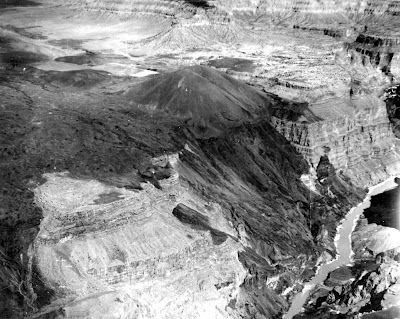 The faults of the Basin and Range provided an easy avenue for magma to reach the surface, and so volcanism has played a prominent part of the landscape visible to us today on the Colorado Plateau. Recent lava flows and volcanoes can be seen in the Zion National Park area, especially near the towns of St. George and Hurricane, and at Mt. Taylor in New Mexico. But two areas of volcanic activity especially stand out: the San Francisco Peaks Volcanic Field in Arizona, and the Jemez Caldera in New Mexico. The San Francisco Peaks Volcanic Field is an immense region (around 2,000 square miles) of lava flows and cones that is dominated by the edifice of the San Francisco Peaks, a huge stratovolcano reaching 12,633 feet above sea level. The volcanoes started erupting in the west side of the field about 6 million years ago, with later eruptions in a more eastward direction, culminating in the eruption of Sunset Crater just 1,000 years ago, making it the youngest volcanic feature in the state of Arizona. Humans witnessed (and suffered from) the eruption, since part of the flow covered an Anasazi village. The origin of the magma remains an enigma, but the eastward progress of the eruptions is suggestive of a hot spot, but this is by no means settled as an explanation. The 600-plus cones in the volcanic field include all manner of cinder cones and lava domes, with compositions ranging from dark black basalt to light colored rhyolite. There is but a single stratovolcano, the San Francisco Peaks, but it dominates the landscape for many miles around. It is the prominent peak seen on the horizon from either rim of the Grand Canyon, and is one of the four sacred peaks of the Navajo people. The mountain grew during a period lasting from about a million years to 400,000 years ago. There is a gigantic east-facing bowl forming the summit of the mountain. For a long time, geologists thought that it formed as a result of slow erosion of the summit of the mountain by way of streams, mass wasting and glaciation, but the eruption of Mt. St. Helens in 1980 gave them a new hypothesis: it may have formed from a giant explosion and subsequent collapse of the summit towards the east. 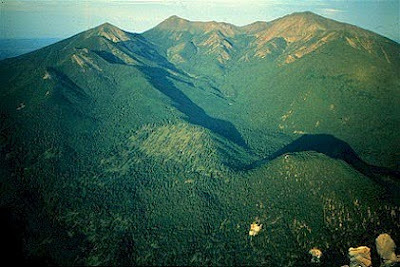 Certainly a comparison of the summit regions of the two volcanoes lends support to the idea (photo of St. Helens by Garry Hayes, summit bowl of San Francisco Peaks courtey of the USGS). Even more intriguing is the idea that we are looking at what may briefly have been the highest point in the lower 48 states and Hawaii. Projecting the lava flows along the broken edge of the summit ridges upwards produces a former volcanic summit that may have reached as high as 16,000 feet, about a quarter mile higher than Mt. Whitney in California. Got a slightly late start on the search for Perseid Meteor Shower, but headed up last night to Pinecrest Lake at just short of 6,000 feet in the central Sierra Nevada of California, set up our folding chairs on the beach to watch the sunset, twilight and deep night. We were breaking the rules by doing our stargazing before midnight, since the best meteors are supposed to come later when the our part of the planet is facing the oncoming chunks of rock. Prior to midnight, the only ones you are supposed to see are catching up to the earth. Just the same, it was a great night for watching space chunks die a fiery death in the atmosphere. We saw dozens and dozens of them, some seeming to cross the sky, leaving a bright trail in their wake. Sitting and watching for many hours allows for nice long conversations about Life, the Universe and Everything*. So often we think of the sky as a one dimensional canvas, when there is huge disparity in the distances between objects. The planes that fly by are 5 or 6 miles away. The meteors are burning up in the uppermost parts of the atmosphere, maybe 30 miles away. The passing satellites are a hundred or more miles away, and Saturn, which was up in the southern sky last night, is millions upon millions of miles away. The nearest star, Alpha Centauri, is four and a half light years away (light travels 186,000 miles per second; a light year is the distance that light travels in one year). The majority of the visible stars in the cosmos (there are 3,000 or so) are hundreds of light years distant, and the Milky Way Galaxy ranges across tens of thousands of light years. We see only the most local part of our Galaxy, which is 50,000 light years across. The most distant object we can see with our eyes is the Andromeda Galaxy, our "neighboring" galaxy. It is 2 million light years from us. I was playing with my camera a bit in the darkness. I can leave the shutter open for as much as 30 seconds, which is how I got the photo above. The dark patch on the right is some trees. 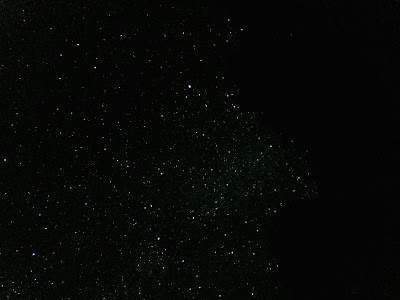 The Milky Way crosses the picture diagonally. Click on the picture for the larger view. If you missed the main meteor show these last two nights, it is not too late. There will be an elevated number of shooting stars for a few more days. Just be sure to find a dark place far from city lights. It's a wonderful way to spend an evening! *with fond wishes to our too quickly departed Douglas Adams and "The Hitchhiker's Guide to the Universe"
NASA may have their problems, but what they have done with robotic exploration of the other planets in our Solar System is, in my highly sophisticated scientific blogger's jargon, really cool. 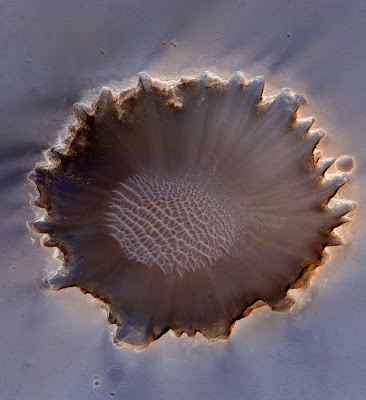 This photo shows the half-mile wide Victoria Crater on Mars, taken from an oblique angle, roughly equivalent in their words to looking out a plane window. Dunes of martian dust fill the bottom, and tumbled boulders and layered rocks are visible in the crater walls. For you conspiracy theorists out there, there are some great tracks on the left side of the photo (see the high resolution version) proving that there is an intelligent presence on the planet. The tracks are actually from the Mars Opportunity Rover, which has been exploring this crater for the last two years (these were bonus years, the original mission was to be a few months and has gone on for years instead). I remember so well as a child in the 1960's being frustrated that the only pictures I could ever see from Mars were these fuzzy disks that revealed nothing of the planet surface. I hope that anyone looking at these incredible images appreciates the fact that we live in extraordinary times when such images of a planet other than our own are so easily accessible. This is a continuation of my long-running exploration of the geological history of the Colorado Plateau which has been going on now for more than a year. If you've been a glutton for punishment, take heart, for it is almost over. We are closing in on the final 20 million years of a story that has lasted for more than two billion. 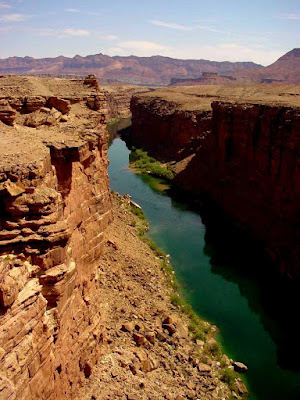 One river system totally dominates the Colorado Plateau: the Colorado River. The present incarnation of the river drains portions of seven states and part of Mexico, an area of just short of 250,000 square miles. In an average year (which we haven't had many of recently), it might provide something like 13 million acre-feet of water, which is used many times over for irrigation, power generation and domestic needs (most of the water agreements assumed a far higher average). Little, if any, water ever reaches the Gulf of California anymore. The river flows 1,450 miles from the Rocky Mountains of Colorado to the Gulf of California. For about 217 of those miles the river flows across the Kaibab Plateau, a place which most people know as the Grand Canyon. The river flows through other beautiful canyons, notably at Glen Canyon and Cataract Canyon, but the Grand Canyon is unique. In places the canyon is more than a mile deep.. So, what made the Grand Canyon? Well, the Colorado River carved it. Probably. That's the easy answer. Now, ask the hard question. What made the Colorado River? The entire river has mysterious twists and turns, and many can be readily interpreted, but the Grand Canyon is a marvelous geological mystery. How did this raging river cross an 8,000 foot high plateau? Some explanations immediately suggest themselves: the river was in place as the plateau rose 50 million years ago, and simply eroded downward as the crust rose. But this doesn't work because the sediments on the west end of the canyon reveal that the river has existed at that site for less than 17 million years. And in any case the Gulf of California is no more than 5 million years old, so the river had to be going someplace else. And that's what makes the mystery so interesting. By virtue of removing the landscape as it cuts downward, the evidence that can tell us the story of the river has been destroyed, except for tantalizing little bits here and there. If anything has been learned from our explorations of the Colorado Plateau over the last year, it is that the earth's crust has been changing and will continue to change throughout time. Rivers don't just "start", and then begin removing a landscape. Drainages evolve along with the landscapes that they traverse, and what happens along one stretch of the river is not going to be the same as what happens someplace else. Sometimes rivers are disrupted by major events, like huge landslides, earthquakes and lava flows, and stream piracy. The short answer as to the genesis of the Colorado river is that we don't know all the answers, but we know a lot about it. The river has existed in its present course for no more than about 5 million years, and it carved much of the Grand Canyon in that relatively short period of time. It was aided and abetted by the Pleistocene Ice Ages, which produced glacial melt runoff many times the natural flow of today. Imagine spring flood runoff with sections of the river hundreds of feet under water. We know that from the end of the Cretaceous to about 20 million years ago, the plateau region was surrounded by highlands, and that most rivers flowed northeast, but may have ended in dry basins or freshwater lakes. The height and timing of the uplift of the plateau during the Cenozoic is one of the controversial aspects of the story (early uplift related to Cretaceous convergence, or relatively recent uplift?). But what is known for sure is that the surrounding regions subsided to form the Basin and Range province and the Rio Grande Rift 15-20 million years ago, leaving the plateau as an elevated land mass. Rivers and streams began eating away at the edges of the plateau by way of headward erosion, and over the years different stretches of isolated rivers were integrated into the single river system we see today. The precise method by which they were integrated is the focus of current research, and a number of interesting ideas have emerged over the years. I've written a couple of times about an interesting version of a stream piracy event that was a prominent hypothesis in the 1970's when I was first learning geology in the Grand Canyon region. 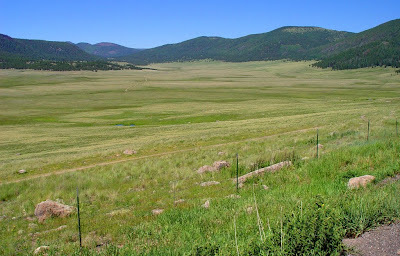 It suggested that headward erosion of a "Hualapai Drainage" cut entirely across the Kaibab Plateau until it captured the ancestral Colorado, which at the time was flowing southeast towards the Gulf of Mexico. The idea of seeing the moment of stream capture has always appealed to me, so I love the hypothesis, but it has some possibly insurmountable problems. Another very creative idea made use of the fact that there are numerous cavern systems throughout the older Paleozoic limestones on the plateau. Perhaps the first route of the waters of the Colorado River across the Kaibab Plateau was under the surface, flowing through caves. Eroded and enlarging the cave openings led to the eventual collapse of the ground above, and the formation of a new canyon. Again, there are problems with the scale of this hypothesis, but it had the virtue of explaining some of the inconsistencies of other models. In the modern era, one hypothesis suggests that the Colorado River may have been forced to the present path across the Kaibab Plateau early on, but that the river drained to the northwest into what is now the Basin and Range Province. 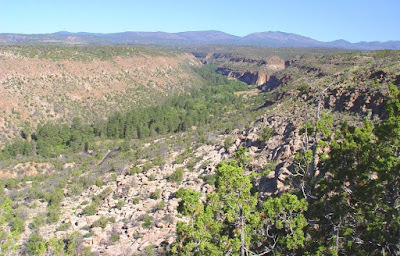 By five or six million years ago, stream piracy robbed the old channel of the Colorado, but west of the Kaibab uplift. The avenue to the sea resulted in a rapid cutting of the Grand Canyon soon after. An alternative modern hypothesis suggests that the integration of the Colorado River system involved the development of huge lake systems which one by one overflowed into adjacent basins, carving deep canyons as they went. http://www.grandcanyon.org/booksmore/booksmore_epublications.asp. The whole entire book! If you want to learn more about the research that is taking place these days, check it out. *borrowed from Norman MacLean, referring to a different river, the Blackfoot in Montana. Great book and subsequent movie, including some unexpected geology references concerning J Harlan Bretz and the Spokane Floods. The final chapters of the geological history of the Colorado Plateau involve huge changes, and a true scrambling of the landscape by tectonic movements, and by erosional activity. Volcanism has been an ever present entity during the Cenozoic era. Each of these elements can be seen in the photo above, the plateau's most famous gorge, the Grand Canyon. On the horizon is the San Francisco Peaks volcanic field, which includes what may have recently been the highest mountain in the contiguous United States. 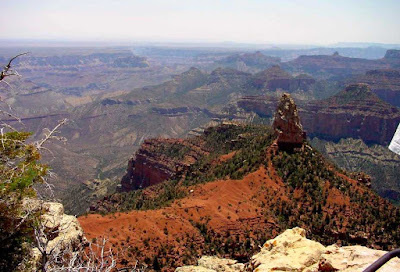 The canyon (seen here from the less visited North Rim) is an obvious monument to erosional forces, and a more subtle monument to the work of tectonics. Most discussions of the Grand Canyon emphasize the ancient nature of the rocks, but the very appearance of the canyon bespeaks geological youth. Incredibly steep canyon walls lining the river for more than 200 miles, compared to an exceedingly flat canyon rim. The canyon is more than a mile deep in places which means the Colorado River has quarried and carried away a tremendous amount of rocks, gravel, and silt. It becomes even more incredible when one realizes that something like two miles of additional sedimentary layers once mantled the flat surface making up the canyon rim. But the weird part of the whole story is: the Grand Canyon shouldn't be here. Like the previous blog entry on the Black Canyon of the Gunnison, the Colorado Plateau is replete with canyons that make no particular sense. And the Grand Canyon is the grand apotheosis of a canyon that should have formed somewhere else, in a far less dramatic manner. The Colorado River changes character when it flows into the Grand Canyon region. For several hundred miles upstream, the river gorge winds back and forth in a series of entrenched meanders, which suggests that the original path of the river was over a relatively flat plain. Then, in the Marble Canyon just east of Grand Canyon, the smaller tributary canyons do something strange: they flow into the canyon oriented upstream, as if the river once flowed in the opposite direction (Think of two tributaries coming together in the shape of a Y. Normally the two limbs of the Y point downstream. In Marble Canyon, the main canyon is flowing the opposite direction). Then, the river suddenly plunges westward, crossing the Kaibab Plateau, which is more than 8,000 feet high, making a number of ninety degree turns, and showing none of the meandering nature of the upper canyon. At the Grand Wash Cliffs, just east of Las Vegas, the river emerges into the desert environment of the Basin and Range Province, eventually flowing into the ocean at the Gulf of California (at least it used to; all its water is taken out and utilized long before any if it reaches the sea these days). How did the river cross the Kaibab Plateau? It would be logical to assume that the river had already established a flow across the uplift before the region was lifted. Then, trapped in a channel, the river carved the canyon as the land rose. A great idea, but the timing is wrong: the Kaibab Plateau is a Laramide structure, which formed around 50 million years ago. But sediments west of the uplift show that the river did not exist there until less than 17 million years ago. And...the Gulf of California is less than 5 million years old. So what the heck was going on? Kim over at All My Faults are Stress Related and a number of other bloggers are asking for help on a survey of women geologists and the geoblogosphere, the results of which will be presented at a GSA symposium. If you meet the guidelines, link up with the survey here. Subaru of America, Inc., in partnership with GSA, has funded a scholarship program to benefit undergraduate minorities considering a degree in the geosciences. The Subaru Minority Student Scholarship Program will provide $1,000 to a student at an accredited university or college in each of the six GSA Regional Sections. The deadline, August 15, is fast approaching. If you are a GSA campus rep or member, nominate a deserving student! More information at Teaching the Earth Sciences. Some large quakes within the Gulf of California a short time ago, with the largest preliminary magnitude at 6.9. They all happened within a few minutes of each other, so I expect the reported magnitudes will change as they sort out the data. The closest town is Santa Isabel in Baja California, 76 miles away. A 5.8 shock preceded the 6.9 event, which was followed by aftershocks at 6.0 and 5.0 magnitude. The Gulf of California is the result of divergence, where Baja is sliding northwest and separating from the Mexican mainland. The movement of Baja is intimately related to motion on the San Andreas fault in California, as Baja and all the lands in Alta California west of the San Andreas are part of the Pacific Plate, which is shifting northwest at around 2 inches a year. It's a good reminder that California is earthquake country, and that enough stress has built up on different sections of the San Andreas fault to produce major quakes. You can read lots more about earthquake hazards at http://earthquake.usgs.gov/. Wording in a poll is everything, and for a long time major polling organizations have been asking badly designed questions about science, especially those on evolution, by wording their questions poorly, and then reporting the results with a misleading emphasis. Following the point made by Devilstower, a headline may very well read "Only 4 in 10 people believe..." but this ignores that fact that a full third of the respondents understood that they didn't have enough knowledge in the subject to give an informed answer. The real news in this poll is that only a quarter of the respondents were wrong in their perception of the science and that their ignorance was influenced by region, political affiliation and race (the interesting point in this poll result is how poorly whites did in comparison to blacks and hispanics, if you want to interpret the results literally). Devilstower does a great job of explaining the inflammatory nature of the use of Africa in the question. Other questions in the poll were highly political ones, including an approval poll for congress and the president. It helps to explain the disparity of the findings in regards to the Southern states. Would the disparity still apply if Europe were substituted for Africa in the question? The big problem with the poll is the use of the word "believe". People believe in deities. People hold opinions that animal testing is wrong. People believe it's wrong to torture prisoners. But does one believe in gravity? Can a person believe they don't need oxygen to live? They can choose not to believe these things, but it doesn't change the fundamental fact that they will fall if they jump off a cliff, or suffocate if they try breathing water. In the most proper sense scientists don't deal with beliefs. They deal with experimentation and confirmation of physical facts. Hypotheses can't be believed in, they have to undergo testing. They will usually be confirmed or disproven, and it doesn't fall to a vote about belief, whether by the scientists themselves, or by the public at large. This misunderstanding about being able to pick and choose what science to "believe" is at the heart of issues like human-induced global warming or evolution. I have a lot of respect for the people who responded in this poll by saying they didn't know. I just hope they take the next step and try to learn something about it. Education is everything in facing the complex problems of our society.